I have been using WordPress as a blogger and a web developer for the last 10 years. And all this time I’ve always been looking for the best WP theme. I’ve used about 30 different paid and three WP themes, and now I know that there is no a perfect theme. Also I know what is important and not important when you are choosing a theme. I made a research about the favorite themes of famous bloggers and finally I’ve chosen three WP themes that I currently use for all my websites. In my opinion they are the best, but sure you can find even better theme. The theme should be paid, regularly updated and have good support. They should update the theme very often, but at least once a year. Find a paid theme made by an established company. One time I bought a theme and just in three months the guys who made the theme deleted their website and disappeared. If you want a free theme, then use the free themes made by WordPress itself. WordPress issues a new theme once a year. Their last theme is Twenty Seventeen. Also you can use a free version of a frequently updated paid theme. The webpage load speed. Your new empty WordPress theme should be very quick. Before you buy it, check its speed with a service pingdom.com. Your website speed is a very important Google’s ranking factor. WordPress theme has to be adaptive and looks good not only on PC, but also on tablets and smartphones. This is also a very important Google’s ranking factor. These are three the most important thing to pay your attention when you are choosing a theme for your blog. Theme Junkie. $99. I’ve been using the themes of these guys for many years. May be 5 or 6 years, I do not remember exactly. I use them because I like the design very much. They do not update the themes very often (once in three years), but their forum support is almost perfect: usually they answer my questions in 1-3 hours. I use their “Daily” theme for this blog you are reading now. I like their beautiful themes and I bought their $99 package. So, now I can access old 55 and all new themes forever and I have lifetime updates and support. Also I can use these themes for as many websites as I want. I highly recommend these guys, but I can not guarantee that they will not disappear one day or that they will update your theme very often. Elegant Themes. $249. This is the king, the best theme ever! They’ve made very beautiful themes and a landing page builder. I bought their $249 package so I have lifetime unlimited access to 90 old and all new themes, a landing page builder, lifetime support and updates, unlimited website usage. 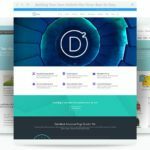 They aggressively advertise their theme and landing page builder Divi all over the Web. And these guys are making an impression of a very big company. Also there are a lot of researches on the Internet which tell that this theme is a blazing fast one. So, guys, I hope that my experience will help you to choose the right theme which is perfect for you. And if you have any questions, please, ask me.